The 2017 vintage was hailed across the north east of Victoria as the “vintage of the decade”. Good winter and spring rainfall restored river flows and replenished underground water systems, leading into a cool and dry summer without massive temperature extremes. The mild conditions continued into autumn, enabling grapes to ripen slowly and fully but without accumulating unduly high sugar levels. Across the board, harvest at Mayford was three weeks later than a “normal” year, producing beautifully pure-fruited, finely structured and super elegant wines. Chardonnay was hand-picked in multiple small parcels over the first two weeks of March. Each batch was processed and matured separately. After chilling overnight, the fruit was whole bunch pressed and filled sequentially to barrel so that no two barrels were alike. Fermented with naturally occurring yeasts in French oak barriques (25% new). Partial malolactic fermentation was encouraged to build more generous and complex structure, and lees stirring for freshness and a creamy, curd texture. Total barrel maturation time was eleven months. 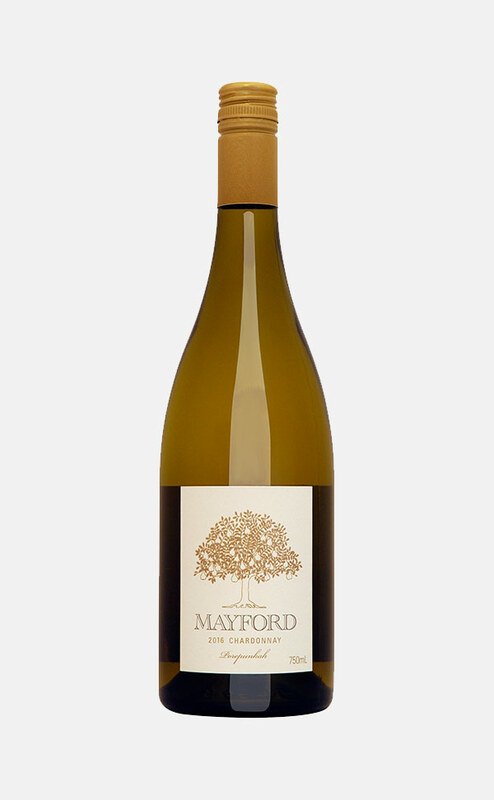 The 2017 Chardonnay is restrained yet rippling with luscious fruit (grapefruit, citrus and nectarine), mealy oatmeal character, a complexing hint of smoky oak and taut acidity. A wine that will age spectacularly. Drink 2019-2030.